Registration includes a login to the online assessment for each selected Module. To purchase the "Counseling-Infused Audiologic " Kindle book, click here. The text, Counseling-Infused Audiologic Care, has been written for students studying audiology within academic programs and for practicing audiologists seeking further exposure to the counseling intricacies of the profession through a continuing education vehicle. Use of this text for self-study is designed (1) to provide a vehicle for acquiring new or expanded knowledge in patient and parent counseling within audiologic practice, and (2) to advance the quality of patient care in audiology. You are able to earn AAA Tier CEUs for self-study by registering for the online CEU program. Counseling-Infused Audiologic Care is available in both a Paperback version and a Kindle version on Amazon. The chapters and appendices are grouped into five modules totaling 7.5 hours or 0.75 CEUs. Registration for the CEU program includes access to all 5 module online assessments. Modules are worth 0.1 to 0.2 CEUs and may be taken together or individually. 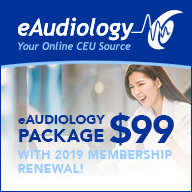 A certificate documenting CEUs earned will be available for immediate download upon successfully achieving a score of 80% or better on each assessment. The Counseling-Infused Audiologic Care CEU Program can be used to meet ABA Tier 1 recertification requirements. To earn Tier 1 CEUs a minimum of three hours need to be submitted during the ABA certificant's three-year cycle.